Colonel Leroy Springs established Springs Cotton Mill in 1896, and Lancaster flourished as businesses opened to accommodate new residents who came to work at the mill. The Bank of Lancaster was built during this time of economic prosperity, constructed in 1907 in the heart of the business district. The two-story building also housed retail space and served as the local opera house, a common venue even for small towns at the turn of the twentieth century. The Bank of Lancaster building still stands as a symbol of an era when cotton was king. Beginning in the 1880s, a number of commercial buildings were constructed in the block of Main Street just south of the courthouse. The Lancaster Downtown Historic District is located along portions of a three-block section of South Main Street in downtown Lancaster and consists of twelve buildings constructed between ca. 1880 and ca. 1935. 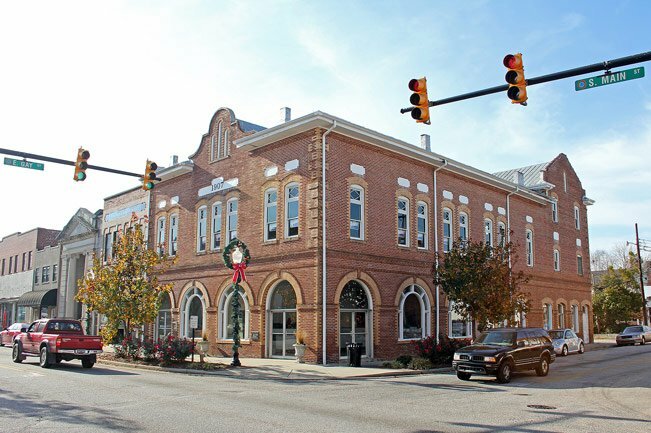 The district includes brick commercial buildings as well as the United States Post Office, the Springs Block, the Farmers’ Bank and Trust Company Building, and the Bank of Lancaster/Opera House. The district is significant as the most intact section of Lancaster’s early business area. Some of the properties are fine examples of commercial architecture. As early as 1799, a Lancaster County Courthouse was located on the present lot, and it is likely that commercial buildings as well as residences were located in the immediate vicinity. By the 1880s a number of commercial properties had been constructed in the block of Main Street just south of the courthouse. It was not until after 1900 that further commercial development occurred in the area of Main Street which comprises the district. My daddy, Richard Plyler, started his banking career with The Bank of Lancaster. I miss him so much & I wish I could ask him this. I believe The Bank of Lancaster became SC National, then Wachovia, which is now Wells Fargo. I will try to confirm this with my brother. Always happy to see postings from a city where I spent 13 wonderful years. Pleasant memories relived! So happy to see Joe Hinson’s photograph here! He does amazing work and this does justice to the magnificent historic Bank of Lancaster building in our downtown!